Coconut water benefits include its contents that include dietary fiber, sodium, potassium & minerals such as calcium, copper, iron, magnesium, manganese & zinc. For weight conscious people, this one is one of the most important health benefits of coconut water. Because it is very low in fat, you can drink as much as you can without worrying about ingesting a lot of fattening agents, such as milk and the like. It can also help you feel full thus, decreasing your cravings for excessive foods. As mentioned before, it is also very low in sugar so you’re actually preventing the onset of diabetes if you drink it. It has more hydrating properties than the average tap water so drinking it can certainly help your digestion well. Sip coconut water thirty minutes after a meal as it can help cure digestive discomfort. It is a form of natural remedy that helps neutralize unhealthy actions of excess stomach acids,coconut water is an efficient antacid. Flu and herpes are some of the sicknesses caused by different kinds of viruses that attack the body. Coconut water has anti-viral and anti-fungal properties that can help you steer clear from these diseases and more! Regular consumption gives long time coconut water benefits such as decrease in risk of cancerous development in your body. 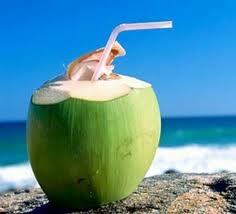 Consuming coconut water often is said to help in improving your body’s blood circulation. Coconut water when fed to infants is said to act as a natural treatment for intestinal worms. Green coconut water contains compounds that work against blackheads and acne. It acts as a natural cleanser & toner skin that is oily.